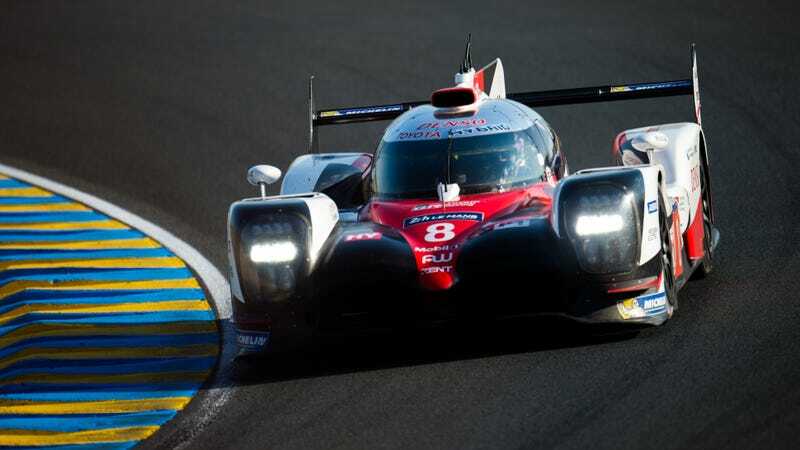 Toyota ran so well this year coming into Le Mans that they no longer feel like the underdogs, but a hiccup during the second qualifying session has us a bit worried. We are still heartbroken over last year’s devastating last-minute failure, where a simple connector failure cost the leading Toyota the race on its last lap. It’s hard not to be rooting for Toyota this year after it looked like they were all set to become only the second Japanese manufacturer ever to win the 24 Hours of Le Mans, long after Mazda’s landmark win in 1991. Tragically, a defective connector on the air line between the intercooler and turbocharger failed, causing the leading No. 5 Toyota TS050 to lose turbocharger control at the second Mulsanne chicane. The No. 5 ultimately came to a halt just past the finish line, when the car would have been starting its final lap. The No. 5 had as many laps as the No. 2 Porsche 919 that was ultimately declared the winner last year. However, Le Mans’ rules are harsh, stipulating that a car must do its final lap in under six minutes in order for that lap to count. The No. 5 ultimately went unclassified, as it took over 11 minutes to limp through its final lap. This year, they’re thirsty for a Le Mans win. Toyota, long the less-funded underdog of the series, brought three cars on a year when über-team Porsche brought two. Porsche’s car is older as well—the 919 debuted in 2014, two years before the TS050 debuted. So far, the TS050 seems to be the faster car this year on pace, winning the first two races of the World Endurance Championship season. So, if we’re more nervous than usual about any Toyota mechanical problems, there’s good reason why. The worst kind of loss is one caused by unexpected mechanical failure when you know the team is capable of pulling off a win otherwise. During the second qualifying session today, driver Sébastien Buemi was instructed to kill the No. 8 Toyota TS050's V6 turbo engine and return on hybrid power only on his out-lap for the second qualifying session today. The problem happened, once again, at that seemingly cursed second chicane on the Mulsanne Straight. Buemi’s car suffered an oil supply problem which forced the Toyota team to swap his car’s engine. The team took apart the rear of the car in the garage and quickly got to work. The session was red-flagged shortly after the No. 8 was damaged—less than 20 minutes into the two-hour session—to clean up a crash where the No. 33 Eurasia Motorsport LMP2 damaged part of the wall. This stoppage allowed the team enough time to install a new engine in the No. 8 and get it back on track, but its time back out was cut short by another red flag due to a crashed N0. 23 Panis Barthez Competition LMP1 that cut the session short. Meanwhile, the sister No. 7 TS050 set a new all-time lap record of Le Mans during that second qualifying session: a 3:14.791. There’s hope yet! With three cars this year, Toyota’s chances look better that one of them can hold it together for the whole race to nab the win. We’re going to be on the edge of our seats the whole time to see if that happens, though.